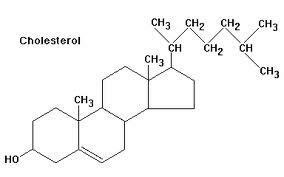 Structurally It’s actually not a fat, but a kind of alcohol, called a sterol, and it’s needed for many purposes in the body. It’s the main building block for making the steroid hormones, like estrogen, testosterone and cortisol. It’s a crucial part in the cell membranes, keeping them in just the right state of fluidity and permeability and with that the cell integrity, keeping it from leaking or being damaged. Cholesterol is also a potent anti-inflammatory lipid, keeping the oxidative stress that naturally occurs as a part of inflammation in order. It’s need for making bile acids. To low levels of these acids will impair digestion of fats and the fat/soluble vitamins A, D, E, K.
Cholesterols are mainly found in animal fats, such as egg yolk, beef, pork, cheese and fish. There is also some cholesterol in plants, but not in adequate amounts. They are called phytosterols and there is evidence (here) that these might compete for the uptake of cholesterol and some other nutrients in the bowels. Cholesterol is synthesized in the liver and the production depends on how much you eat, rising with less and lowering with higher intake, keeping the levels in blood at a close range. That’s why the amount of cholesterol in your diet wont affect the blood levels much. The liver is also responsible for the transportation of cholesterol to the tissues in the body. Next postCholesterols – good or bad? Part 2 – What does it mean?